Recently, I was knitting a complicated sweater pattern, and needed to keep track of which row I was knitting. 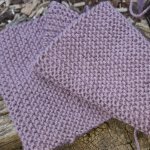 Even though I thought I was doing fine keeping track, by checking off each row on a grid that I drew up, sometimes I would forget to check-off the row I had just knit! So to double check myself (aha), I am using two different colored needles (of the same size of course!). Right now, my pink needle is making the odd rows, and my grey needle the even numbered ones. That way even though I may forget to mark down where I am in the pattern, the needles never lie!!! This is a really great idea. It is simple and easy to implement and will definitely solve the problem.